Yeah! 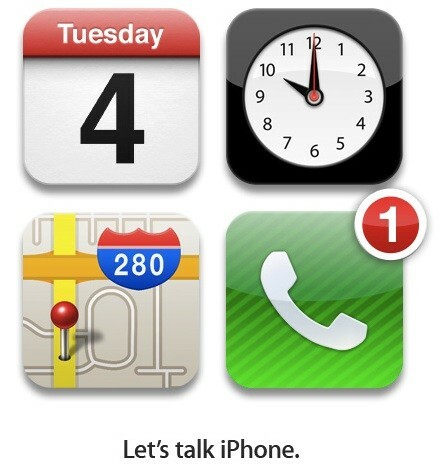 Apple had just sent the invitation out to media for the iPhone event slated on 4th October 2011. The rumor has been confirmed. After waiting and waiting, rumors after rumors, finally, we Apple fans have gotten a solid information on the iPhone 5/iPhone 4S. Now the bigger question is, will the iPhone launched is iPhone 4S which is just an upgraded iPhone 4 or iPhone 5, a completely redesigned iPhone? Well, we still have 6 days to go before Apple gives us the answer. For our fellow Malaysians, you might be thinking when will iPhone 5 or iPhone 4S coming to Malaysia. Well, Maxis CEO Sandip Das had publicly announced that Maxis is working very closely with Apple to bring iPhone 5 to Malaysia as soon as possible. For those of you who are waiting to get iPhone 5/iPhone 4S, this 4th October 2011 is just launching of the iPhone 5. The sales of iPhone 5 is rumored to be somewhere 14th October 2011 (Friday). Many of Apple Store employees has been blocked from taking holidays starting from 14th October 2011. So, if Maxis CEO is able to do what he said, we will still have to wait until 14th October 2011. Maxis Motorola Xoom launch date in Malaysia CONFIRMED!!! This Thursday, April 28, 2011!!! iPhone 5 will only be available for sale as early as October 7 2011? 26th Oct 2012 is iPhone 5 Release Date in Malaysia? Nano-SIM Availability, iPhone 5 Drop Test & iPhone 5 Tear Down! Why you people want to buy a phone that could only download from ONLY one apps store ? Don’t you guys have any other gadget to spend with your hard-earned money ? I’m not an IT geek, so I don’t know much about phones. I heard you need to pay for most apps i.e games, wassap..is it true? Recently I bought Galaxy SII and I love it a lot! I can live enough with their free apps. HD, e-books, wide screen, everything is just so cool. After 2 months, it got stolen – i did not install/activate any security so I lost it just like that. Stupid me. After I lost it then I know that the security is amazing and I would get back my phone if I activate it. There’s also apps that can be downloaded from the market called Plan B, in which u can get it install to your lost phone and track it. Too bad, think it’s not for Msia. Certainly that iPhone 4/iPhone 4S has all the cool features of SGS2. Depends on your preference. The new feature of iPhone 4S, Siri, virtual assistant is quite nice, based on the US reviews. Hahaha… Usually you get most of your apps from one apps store, don’t you? Next story Oh, there is one more thing. iPhone 5 is coming!